I thought Dirt was going to be another feel-good, coming-of-age sports movie. And in many ways it is. What I did not bank on was the fact that it kind of turned out to be a walking talking Lucas Oil ad. Which, if you watch the movie through that lens, makes things truly bizarre. I will admit that I didn’t have high hopes for Dirt. I watched the trailer and gleaned from the pitch email that it was probably a direct-to-DVD movie. So, over the weekend and after an appalling viewing of a trash film I won’t name here (but rhymes with Bustice Feague), I popped in Dirt. The plot is not an unfamiliar one. Seventeen-year-old Dez Truss (DeRon Horton) boosts expensive cars to help provide for his younger sister. He gets caught. And in order to convince the court that he can keep taking care of his sister and not be put in prison instead, he joins an off-road truck-racing team, led by ex-truck racer, Rick Radden (Kevin Dillon), to set himself straight. Dez starts out as the shop boy on the team, but because he knows cars and he knows how to drive (he was part of a youth-oriented racing outreach program), he quickly climbs the team ranks and becomes the driver after Rick fires their original driver for being an overall shithead. With Dez’s help, the team is eventually able to pull itself to victory. And through it all, Dez is able to find a place where he belongs. It’s all very Free Willy meets Cars. If you do wind up watching this movie, here’s a little drinking game you can play: Take a sip each time you see a piece of Lucas Oil branded merchandise pop up onscreen. You’ll be blasted before the halfway point. I’m calling attention to this because of the overpowering brand-ness of the film. I can probably count on my hands how many scenes didn’t have some kind of prominent Lucas Oil logo showing. Lucas Oil hats. Lucas Oil t-shirts. Lucas Oil trailers. Lucas Oil tents. Lucas Oil porta potties (I’m joking about that last one). You get the point. Plus, the film had several real race car drivers playing themselves (Carl Renezeder, Rob MacCachren, Doug Fortin and Kyle LeDuc all make appearances). What did all of these men have in common? 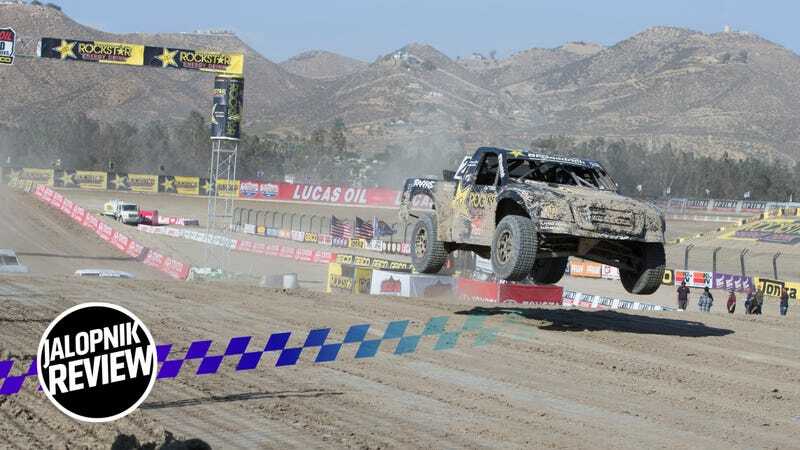 They have all raced in the Lucas Oil Off Road Racing Championship. The plot thickened. Lucas Oil, Lucas Oil, Lucas Oil. I just couldn’t ignore it anymore. As it turned out, it was because Forrest Lucas, the founder of Lucas Oil, was the movie’s executive producer. After learning that, I couldn’t shake the feeling that I was watching one, big 100-minute Lucas Oil commercial. Clearly, Lucas paid for a lot of this movie and you really cannot forget that, even if you try. Because I tried. A lot. (As an aside and between you and me, Protect the Harvest is Forrest Lucas’ non-profit pro-puppy mill project headed up by a man named Brian Klippenstein, who was Donald Trump’s USDA transition leader. The Dog Lover was also directed and produced by the same people who wrote and produced DIRT (Alex Ranarivelo and Ali Afshar, respectively). Sure, I suppose that makes things more authentic, something was still off about it. Other motorsports movies like Rush use real race footage as well, but Rush was based on a true story. DIRT is not. So, it’s like these real-life race car drivers show up in a movie about a fictitious race team and they are... playing themselves? In this fictitious narrative? Obviously, I have no way to prove this, but that’s what the whole thing felt like. All of that being said, DIRT is actually entertaining. Though it never says specifically in so many words, this is a film about a black kid making it as a driver in a white man’s race. All of the other drivers on the other teams are white men. Rick’s original driver flings insults at Dez for being black. The overall message is that talent exists everywhere, and if people from all walks of life are given opportunities to prove themselves, they might just come out on top of the established order, regardless of the gatekeepers. Yes, Lucas Oil signage is splashed everywhere, but the racing footage included is cool. Although there are some visual inconsistencies (certain trucks wearing competing signage and shots from different tracks being used in one race), most viewers probably won’t notice. DIRT touches on serious topics, but you naturally take them seriously because they are presented as such, not because some character said so. You care because the characters all feel very real and relatable. They don’t feed you dumb lines that distract you because no one in reality would ever speak that way. You find yourself rooting for them. Of course Dez places first in his truck at the end. And of course he finds himself a new family with Rick’s team and gets to keep taking care of his sister. The Good Guys win. You know all of that is going to happen, but you’ll still watch the movie anyway because the story is compelling and you feel good watching it. I thought about the millions of dollars Bustice Feague must have cost and I laughed because this movie was better and more entertaining in every way, even though it didn’t have to be, since it’s generally just a feature-length commercial. It’s a pleasant surprise, which is definitely the best kind. If you do watch it, I would suggest doing it with your wits about you because the movie is paid for by and features Lucas Oil. Know that you are watching what amounts to a sponsored ad, even though it does have a nice plot. Here’s where you can download a digital copy or buy a DVD.